Lately I've been challenging myself to find the beauty in my home state. I get caught up a lot of times after traveling thinking that where I live "isn't cool enough" and I day dream of flying out to Cali or NYC for the day to shoot epic pictures and explore new places. However, #1 I can't afford to do that every week and #2 There already aren't enough days in the week to get everything done lol! Michigan is beautiful. We are surrounded by the Great Lakes and are lucky to experience all seasons in full force. The only thing stopping me from seeing all the places in Michigan that I haven't yet is time. I work part time as a creative director for an awesome company while trying to pursue my blog and sometimes there just aren't enough days in the week like I said before! But I'm not letting that stop me - I've decided to start taking the time to adventure around my state and boy, I live in a pretty amazing place! I'm still planning on traveling around the country though - I'll be in NYC in December! WOO! Anyway, back to Michigan - There is something I've always loved about being by the lake. Maybe it was growing up spending my summers on Lake Michigan or my endless years on the swim team. However, anywhere on the coast of Michigan is dear to my heart. 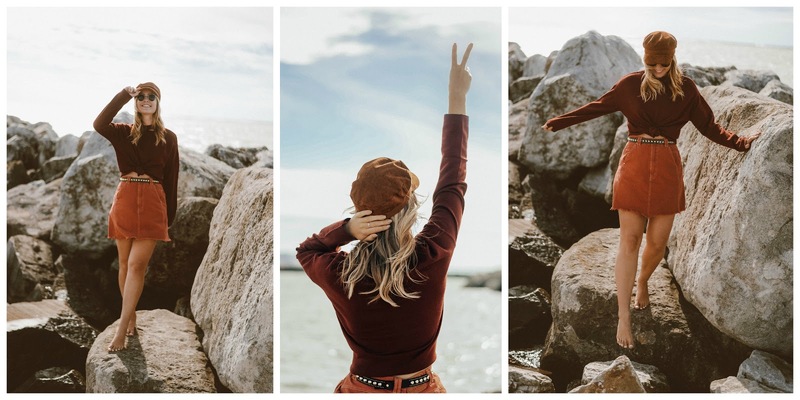 Tyler and I recently took a tiny day getaway to Ludington and they had the most beautiful pier with giant rocks that I couldn't help but check out! ALSO, FYI... lol - When rocks get wet, they are REALLY slippery. I definitely found out the hard way! 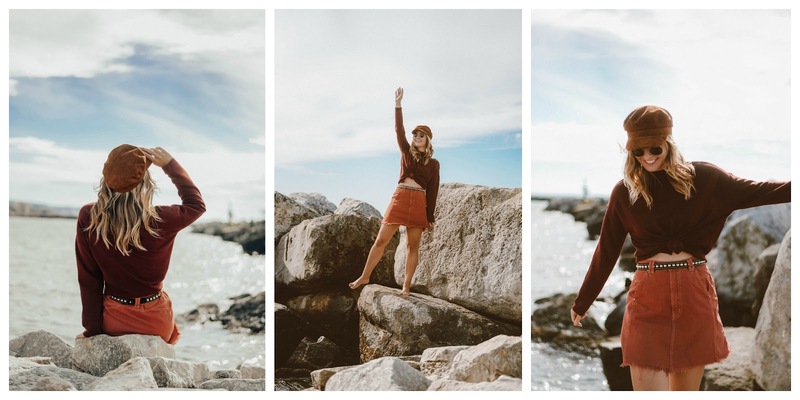 About 45 minutes after these photos were taken my sunglasses blew away off the pier and as I tried to carefully inch my way to get them I ended up slipping and falling in to the water! (insert laughing while crying emoji). Yes - It totally hurt and Yes - I was able to save my sunglasses! haha! While in Ludington I wore this cute and casual look thanks to LuLus.com! 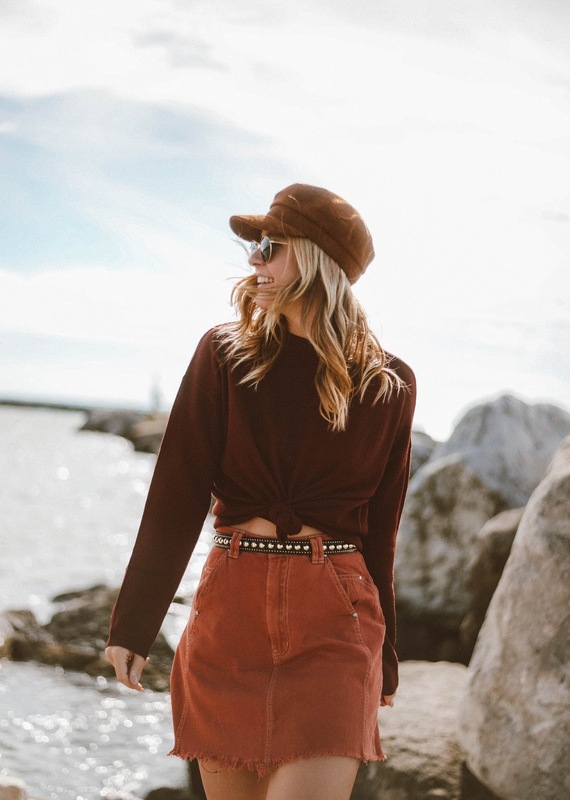 I'm really excited to have had the opportunity to collaborate with them and this skirt and sweater are two of my favorite pieces from their site! Both of these seem to run a bit large so I would definitely recommend sizing down!